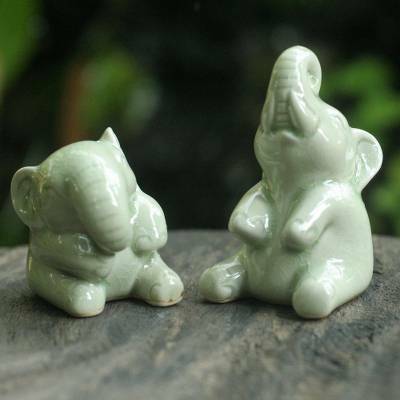 Hand Made Celadon Ceramic Sculptures (Pair), "Happy Green Elephants"
Duangkamol conveys the universal emotions expressed by Thai elephants. Working in cool green celadon ceramic, she creates an enchanting pair of statuettes. The lovely green pachyderms are wonderfully detailed, seeming to share in belly-shaking laughter. You can find celadon ceramic statuettes 'Happy Green Elephants' (pair) by Duangkamol in sculpture categories such as Animal Themed Sculpture, Celadon Sculpture and Ceramic Sculpture. Enjoy exploring these sections for other Novica treasures. "My daughter and her husband loved them"
The little elephants were sweet and whimsical. The perfect combination for the holiday gift. These little guys are so cute, you can't help but smile when you look at them. The craftsmanship is great; they were just what I was looking for. The package arrive on the day Novica estimated, the set were gift-wrapped very nicely. I won't hesitate to order other porcelain from them. I love elephants and these playful little figurines are so cute and fun! They bring a smile to my face and I appreciate the beauty and craftsmanship involved. Thank you so much! I am very happy with my purchase of these wonderful ceramic elephants! They are adorable and will certainly have a special place on my mantel for years to come! I love theses little green elephants. I have purchased two of them as gifts and my friends love them. Workmanship is fantastic! I saw these elephants and just had to have them. They are so cute! I had my eye on these darling little elephants for quite some time. I finally bought them as a gift to myself for this Christmas--and I just love them! They came very well packaged--lots of packing material and cushion, so there was no damage at all. I could tell as I held them in my hands that they were well made and would be very special. The color and glaze is beautiful and so unique. Their little faces can't help but MAKE you smile! I instantly fell in love. These little elephants will be cherished for a long time. They would make a perfect gift as a "just because", the "hard to shop for" or the "one that has it all." They are so charming! The minute I saw these little elephantsI knew I had to have them. They came very nicely packaged and looked just like the pictures. I love the details and they are very special! I love elephants and make a great addition to my collection!! Thank you! Gift to a small boy who is thri lled with them. ( He has allergies to fluffy toys that can carry dust.) The best part is the elephants can be used by his clever parents who create all sorts of stories for him and after the story-time the elephants watch by his bedside table all night bringing good dreams & comfort.